People will always need lawyers. However, plenty of job options exist within the legal field beyond becoming a lawyer. The delivery of legal services is a complex process that typically requires teams of skilled professionals to provide quality and cost-effective service. As a result, the legal field offers many jobs encompassing a diverse range of skills, experience, and education. Developments in the law and technology have also created new legal career opportunities. Lawyer: Also called an attorney or counselor—or a solicitor or barrister in parts of Europe—a lawyer advocates for their clients' rights. They may do this through negotiation with other parties to a lawsuit or through litigation. They effectively steer the ship. The failure or success of a firm begins with the abilities of its lawyers. Paralegal: This person serves as the lawyer's right hand. A paralegal takes over certain tasks to free up the attorney's time so he can take care of things that only an attorney can do, such as appear in court or give legal advice. Paralegals may draft pleadings, assist clients, and do legal research under the supervision of the attorney. Legal Secretary: Also called an administrative assistant, this position entails less responsibility than a paralegal but often more than the average secretarial role. Responsibilities include the normal sphere of secretarial duties in addition to things like file maintenance and drafting basic correspondence, such as letters to clients notifying them of upcoming court dates. Legal Assistant: Both paralegals and legal secretaries may be referred to as legal assistants. Compliance Specialist: This employee implements and oversees corporate compliance with applicable laws and policies, both locally and at the federal level. The position may include training employees in compliance procedures. Conflicts Analyst: A conflicts analyst fills a delicate role within a law firm. They research potential conflicts of interest between firm personnel and parties involved in a case, including judicial staff. Maintaining a high level of confidentiality can be critical. Legal Recruiter: This position does not involve working within a law firm. A legal recruiter provides their clients—typically law firms—with potential employees. Those employees are usually attorneys but sometimes paralegals as well. A Juris Doctor degree may be required. Court Messenger: This is the person on the go, responsible for making deliveries of documents and other evidence to courts and to other attorneys. Litigation Support Professional: This job can require both technical savvy and an understanding of the law. Litigation support professionals work with software and applications to manage case data that's crucial to litigation. E-Discovery Professional: This role is similar to that of a litigation support professional but mostly focuses on discovery—the exchange of information pertinent to a case between the courts and parties to a lawsuit—rather than the totality of a case file. Discovery is being condensed into electronic storage mediums more and more in the millennium. Document Coder: This is largely a data entry position. The coder maintains a system to identify and access the various documents in a case file. It's typically an entry-level position in IT litigation support. Judge: The judge oversees trials, pretrial conferences, pretrial rulings and, in some cases, appeals. This a public sector position that may be appointed or elected. Their overall job is to interpret and apply the law. Magistrate: Not all states make use of magistrates. These are "junior" judges or judicial officers who are entrusted with minor cases and disputes to take some of the weight of caseloads off judges. Law Clerk: Law clerks are to judges what paralegals are to attorneys — their right hands. They're often law school graduates who have not yet applied to the bar, but they may be new, young attorneys just getting their feet wet as well. It's a prestigious entry on a resume. Law clerks manage the judges' case files and do research, drafting condensed reports on filed documents as guidelines. As a result, the judge doesn't have to read the entire bulging case file to get a handle on what the matter involves. Mediator: Also called an arbitrator or conciliator, a mediator handles alternative dispute resolution (ADR), which many states require before a civil lawsuit can proceed to trial. The mediator meets with and attempts to guide opposing parties to compromise or settlement. They don't "represent" either side and may or may not be an employee of the government. Court Reporter: This is the stenographer you see seated beside the judge's bench. They transcribe legal proceedings, hearings, trials, and even depositions. More courts are moving to audio recordings, and court reporters also transcribe these tapes. Broadcast Captioner: Videography in the courtroom is common. This job involves entering captions on videography, often in real time in the course of a trial, which is then preserved as part of the case file in the event of an appeal. CART Provider: CART stands for Communication Access Realtime Translation. It most commonly involves assisting the deaf and hearing impaired, converting speech to text for their benefit. 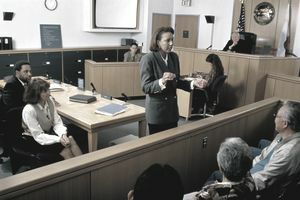 Jury Consultant: A jury consultant guides attorneys toward selecting sympathetic jurors at trial and helps them avoid unsympathetic jurors. They do this by posing a series of questions to potential jurors. It can also involve doing background research and interpreting body language, both during questioning and later during trial. Computer Forensics Professional: This professional analyzes digital evidence and reports on it. They may also testify regarding it at trial. Think of a hard drive that's been intentionally erased, but some trace of data remains behind. The computer forensics professional would unearth that. Forensic Scientist: A forensic scientist helps to collect, preserve, and analyze physical evidence for attorneys and the courts. A blood spatter analyst is one example. Legal Videographer: Also known as a forensic videographer, this career option involves creating video images for trial. The videographer may also present the images at trial under oath. Accident Reconstructionist: This individual often has a background in engineering or law enforcement. THey examine the details of an accident to recreate how it might have occurred and ultimately who, if anyone, is to blame. Law Firm Administrator: Sometimes called a practice administrator, this top-tier administrative position oversees the day-to-day operations and finances of a law firm. Contract Administrator: This individual typically works under the practice administrator dealing with specific areas of day-to-day finances, particularly those involving contractual obligations. Courtroom Deputy: You'll typically find them in a law enforcement uniform helping to maintain order in the court. They may accompany criminal defendants to and from the courtroom or intercede between counsel. For example, they may pass an item of discovery from one table to the next or to the judge. Court Interpreter: A court interpreter assists non-English-speaking litigants. Court Clerk or Prothonotary: This is a behind-the-scenes role in the courthouse but no less important. Every legal case involves reams of filed paperwork, even in this time of technology. Clerks accept it from litigants and keep orderly track of all of it. The job ranges from entry-level positions to chief clerk. Law Professor: Law school professors not only teach classes but are typically involved in research as well. Many schools also require that they periodically publish in law journals. Law School Dean: The dean is the highest ranking administrator in a law school, supervising operations, academic programs and even sometimes issues of student discipline. Law School Admissions Officer: This individual oversees and reviews student applications and test scores and may also personally interview potential students for acceptance. Legal Career Counselor: Many law schools, particularly top-tier schools, employ someone to prepare graduating students for entering the workforce. They might conduct mock job interviews, help identify potential employers, arrange interviews with law firms, and even make the initial introduction. Loyalty to the school and marketing the school and its students to future employers is paramount. This list is not all-inclusive, but it represents a broad sampling of the hundreds of opportunities that exist in the legal industry. Many of these positions are available only in larger firms. What Does It Take to Become a Lawyer?